Those are the words not of a new birder, but of a highly experienced visiting birder with thousands of birds on his life list who resides in bird-rich Extremadura, Spain. 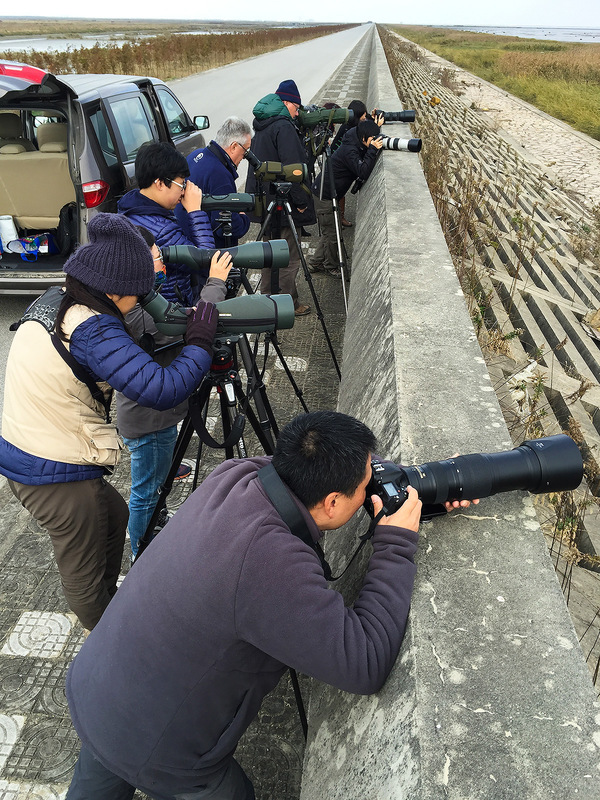 Birding Pudong’s Cape Nanhui at the height of the spring migration left Mike May open-mouthed. Should anyone be surprised? 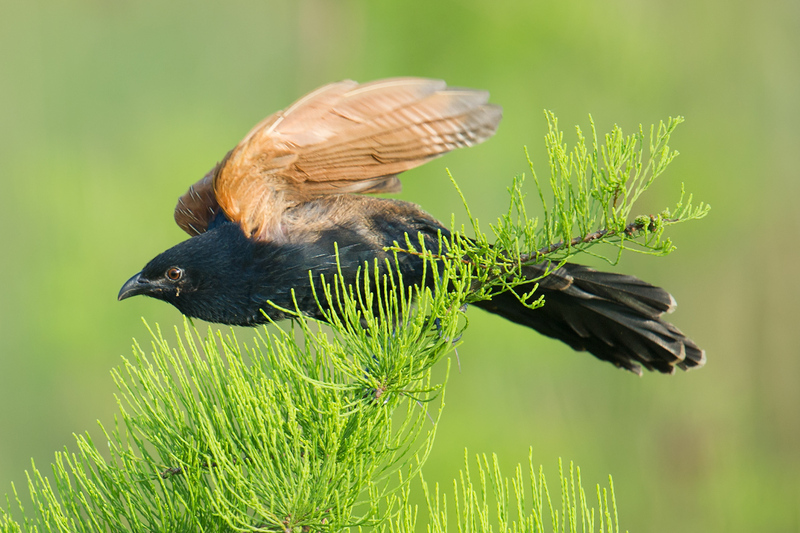 The most southeasterly point of Shanghai is a world-class birding site. Mike’s 92-species day, Sat. 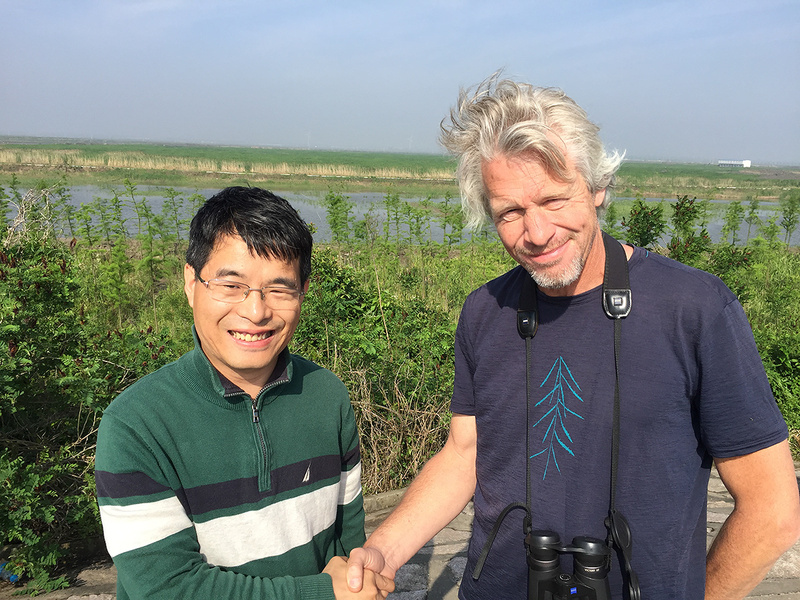 13 May 2017, with Beijing-based Swedish birder Jan-Erik Nilsén and me included ultra-rarities such as Orange-headed Thrush as well as Pallas’s Grasshopper Warbler and Lanceolated Warbler. A pair of sub-adult Black-faced Spoonbill were getting by on the ever-shrinking pools at the beleaguered site. The eBird list for Pudong Nanhui Dongtan Wetland. Submit your records! It’s fun! These records brought the all-time list for Cape Nanhui to 288 species, according to eBird—making Cape Nanhui the second-hottest birding hot spot in China. Let me say that again: Of the thousands of birding spots in this vast, mega-diverse nation, the cape 60 km southeast of People’s Square is second only to Baihualing in Yunnan in species noted. Sound unbelievable? Let me say something even more unbelievable: Not only is this rich spot completely unprotected, with not even a square meter preserved in any legal way; but it is, to the contrary, being actively destroyed, even as I tap out these words. The backdrop to the work of Mike, Jan-Erik, and me was fleets of bulldozers and backhoes, busy throughout the weekend. They clattered and clanged, and the pumps transferring water into the newly dug canals whirred and chugged. The pace of transformation is faster than ever now. “Nanhui is gone,” my partners and I said. A major ecological area, a place combining ease of access to millions of residents of Earth’s largest city and a favorable position on Earth’s greatest migratory flyway, is being utterly transformed. 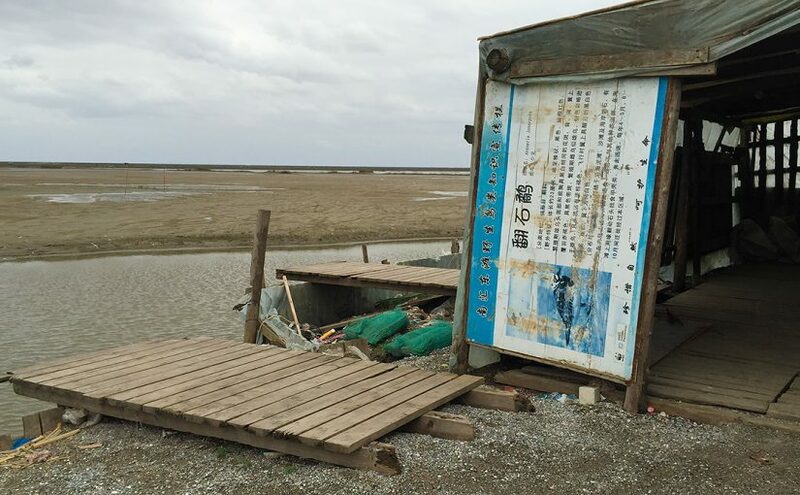 While the Cape Nanhui that I have long known falls, huge tracts of adjacent tidal mudflat are being reclaimed, adding dozens of square kilometers to the land area of Cape Nanhui. Birding there in theory could have a future. A Cape Nanhui Nature Reserve could be set up in the new area. But even as the Cape Nanhui we know falls, no one, to my knowledge, has hastened to reassure conservationists that areas in the newly reclaimed land will be set aside for birds. In the city-province of Shanghai, which is the size of the U.S. state of Delaware, a few places have indeed been set aside, among them Chongming Dongtan. But those reserves are small, on remote islands far from mainland Shanghai, and practically unreachable by the millions of middle-class Shanghainese who lack a car. 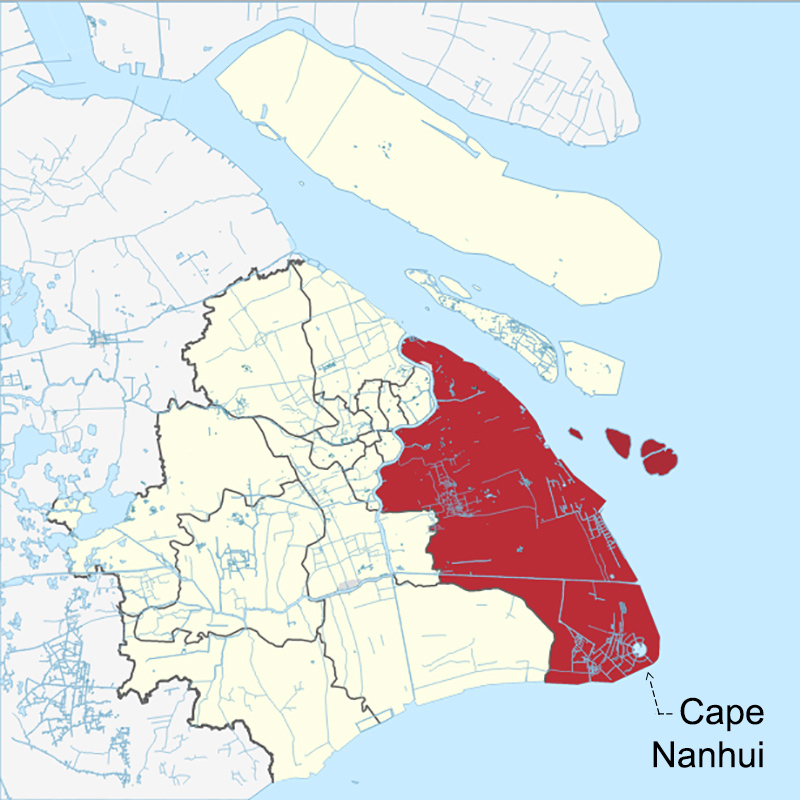 Cape Nanhui, by contrast, is easily reachable from the city. 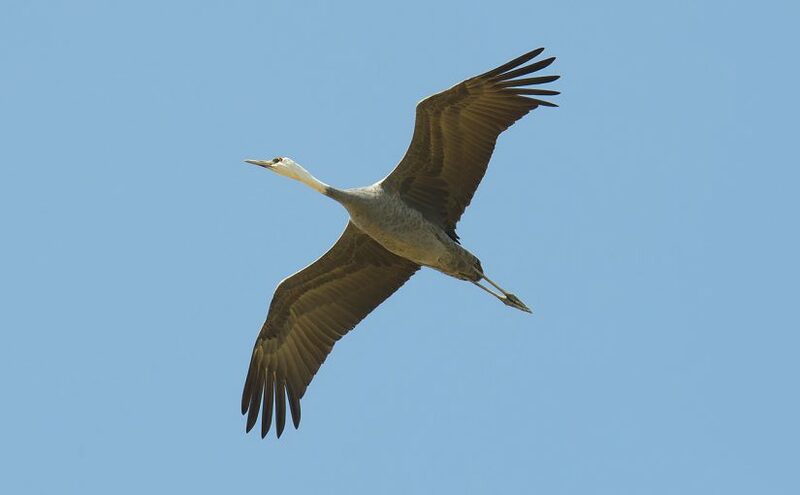 And it is the one place where masses of bird lovers can conveniently get a taste of the grand spectacle that is spring migration along the east coast of the Eurasian supercontinent. That opportunity is being taken away, not only from the birders alive today, but also from the birders of the future. 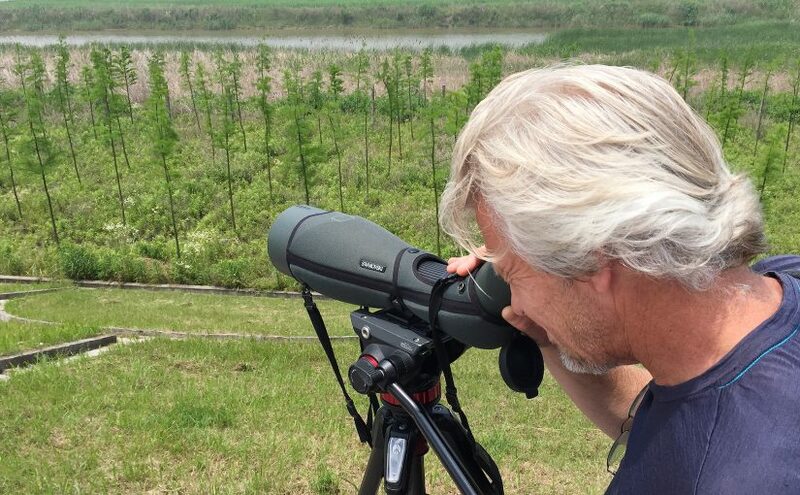 Our agony over the fate of Nanhui was tempered by the joy of birding. 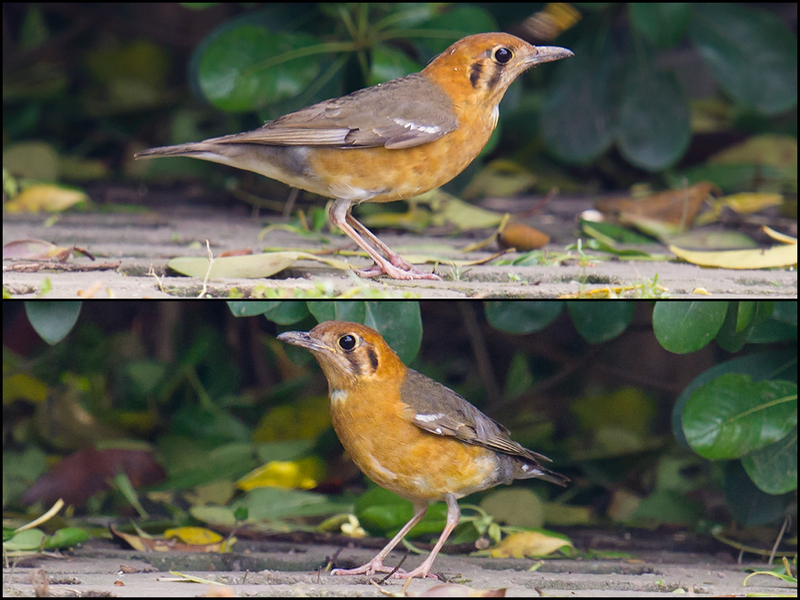 Orange-headed Thrush showed up Saturday at the Magic Parking Lot (30.884898, 121.968229). With the two vertical bars on its face, our specimen was either of race melli (breeds Guangdong, etc.) or courtoisi (Anhui). On Sunday the Magic Parking Lot delivered singing Grey-crowned Warbler Seicercus tephrocephalus, and in Microforest 2 (30.926013, 121.970705) an appearance was made by Alström’s Warbler S. soror. Neither breeds in the region; both are very rare vagrants to Shanghai. Iron Track (31.003613, 121.907883) gave us singing Yellow-breasted Bunting in full breeding finery and singing Pallas’s Grasshopper Warbler. I captured the latter’s song, rarely heard in Shanghai. The Marshy Agricultural Land (30.850707, 121.863662) near Eiffel Tower was highly productive, yielding Lanceolated Warbler, Forest Wagtail, and Striated Heron. Sunday saw Jan-Erik and me note 78 species. 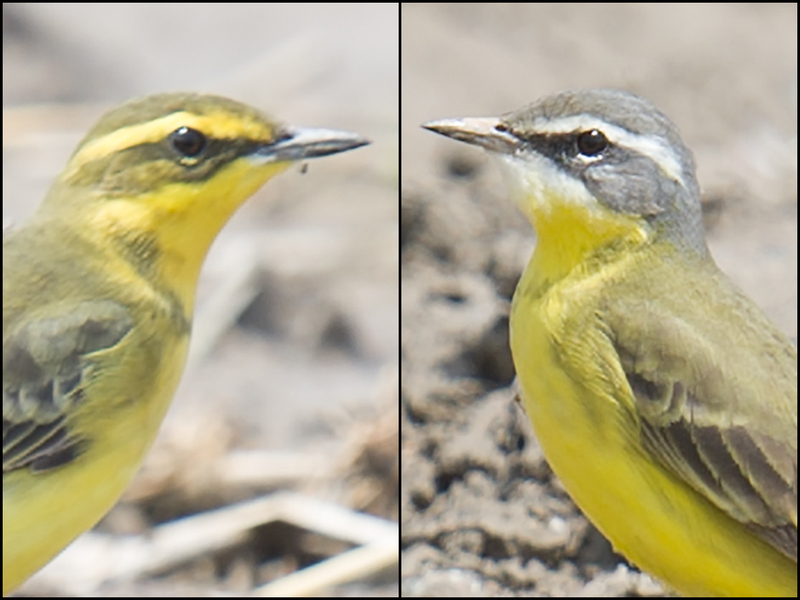 Some of the more challenging Seicercus warblers. 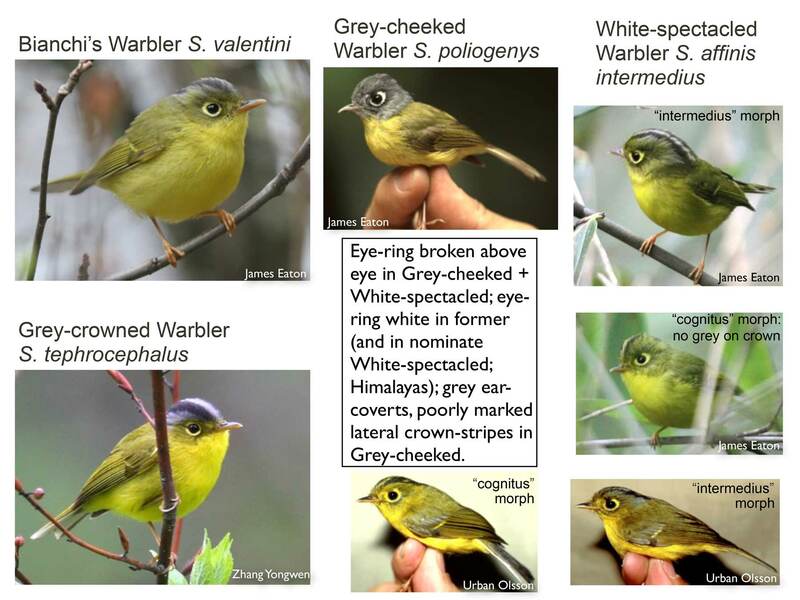 This graphic was created by Shanghai Birding member Per Alström for a presentation he made to the Beijing Birdwatching Society in 2012. 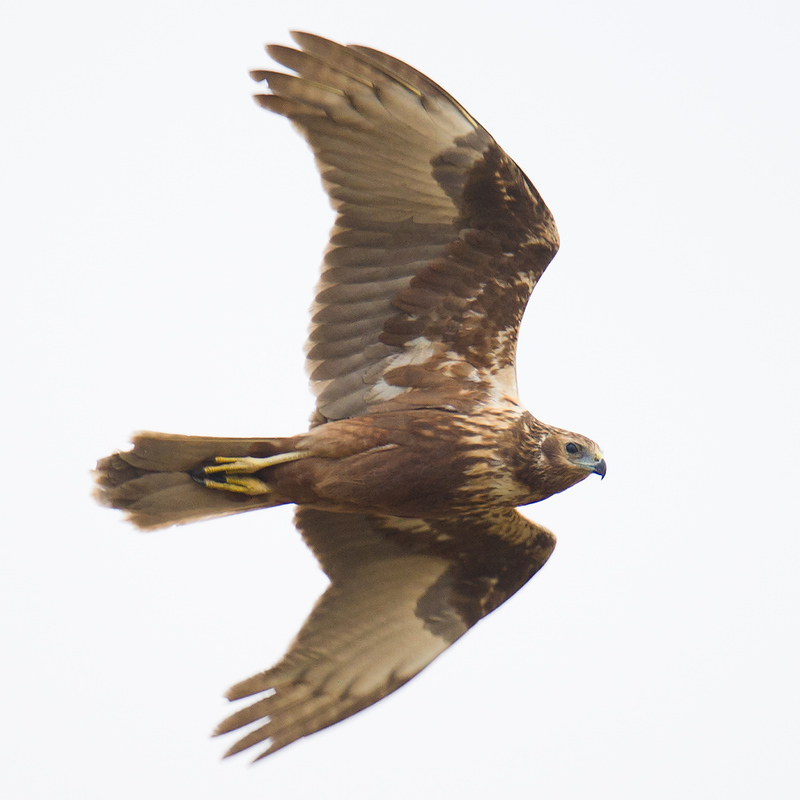 The PDF is downloadable through shanghaibirding.com. 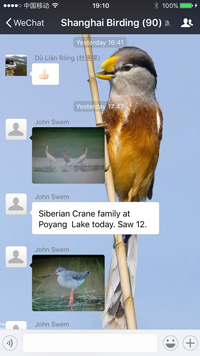 Shanghai Birding is the WeChat companion to this Web site. 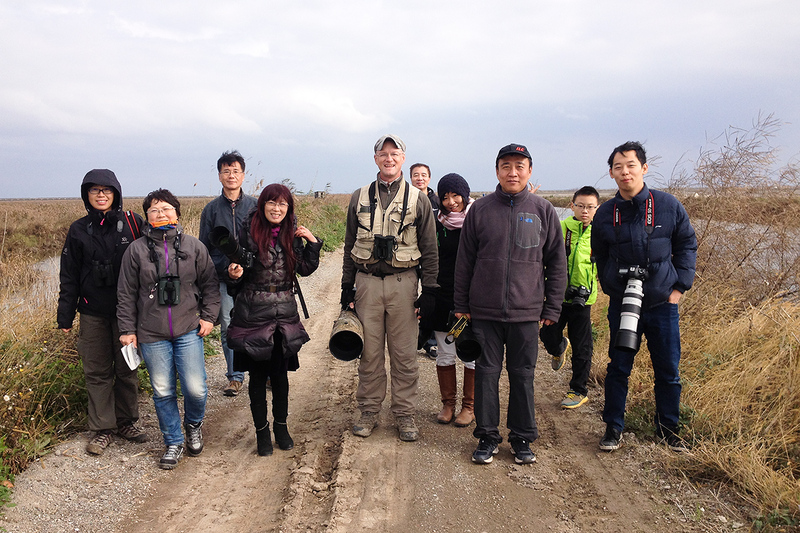 Our members include everyone from persons brand-new to birding to some of the most knowledgeable birders in China. We discuss everything from the most common species to the most arcane. Paul Holt: Can you post your recording of yesterday’s [14 May 2017] Alström’s Warbler as well please, Craig? Craig Brelsford: Will post after I get home. Meanwhile, have you assessed the recording I posted yesterday morning? 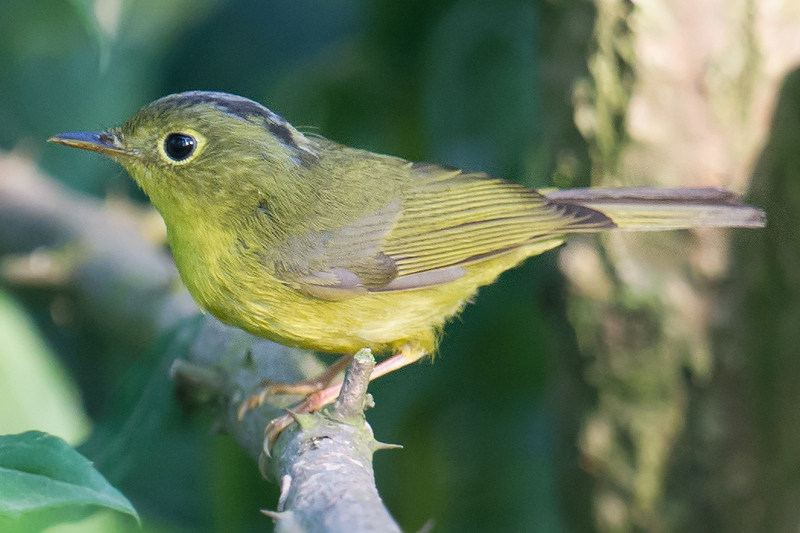 Do you agree it’s Grey-crowned Warbler? Jonathan Martinez, I’d like your view, too! 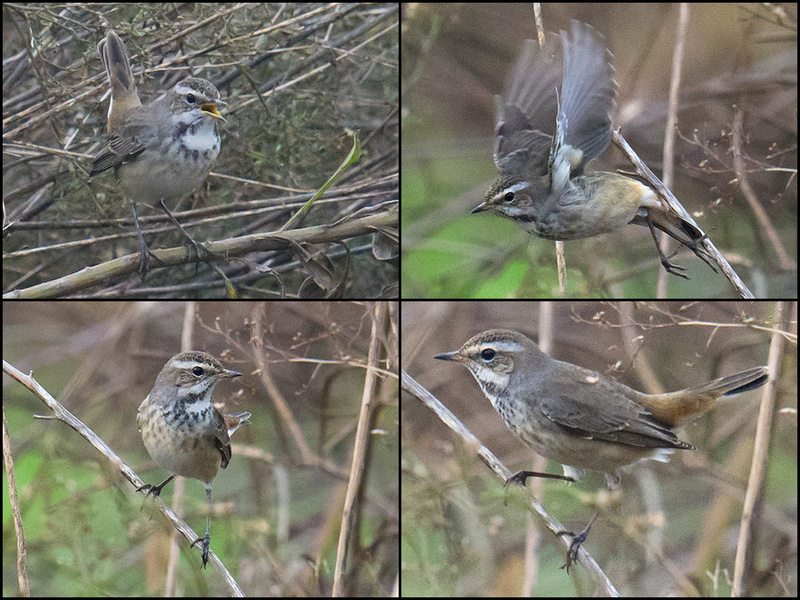 PH: For what it’s worth, while there are probably 30+ records of “golden-spectacled warblers” from coastal Hebei, very, very few have been as well documented as Craig’s and team’s recent Grey-crowned. Many have been photographed but far fewer sound-recorded. Alström’s is so far the only one so far known to breed north of the Qinling Shan (it’s a scarce and very local breeder at two, possibly three, sites in Beijing). 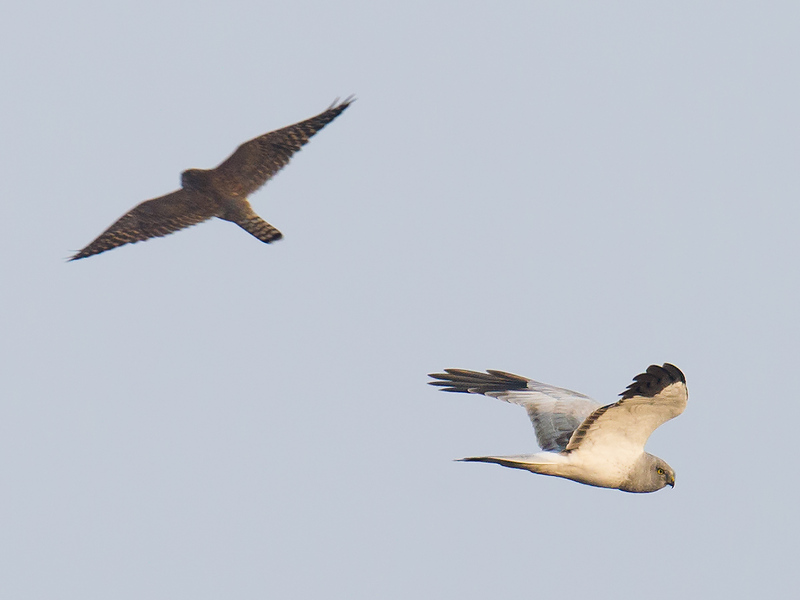 Personally I’ve never seen soror in coastal Hebei (nor am I aware of any being sound-recorded there), but I have noted (and sound-recorded) 2 Bianchi’s S. valentini and 1 Martens’s S. omeiensis in coastal Hebei. I understand that the only (?) 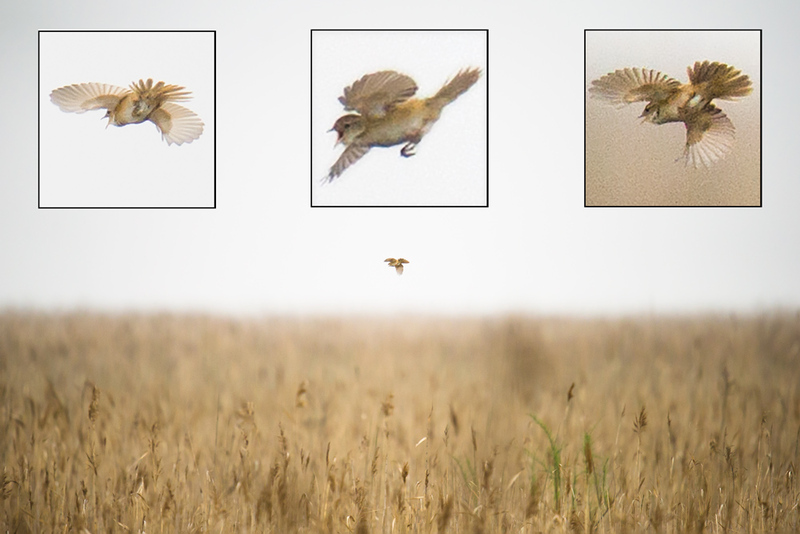 three coastal Hebei birds that have been captured and had their DNA compared have all been omeiensis. We’re very, very far from ascertaining the true statuses of these Seicercus in our area, but you perhaps should/might see more in Shanghai and coastal Zhejiang. As many of you already know, there are some excellent sound recordings of these on Per’s site. CB: Great analysis, Paul, and great that you point out the resources on Per’s site. 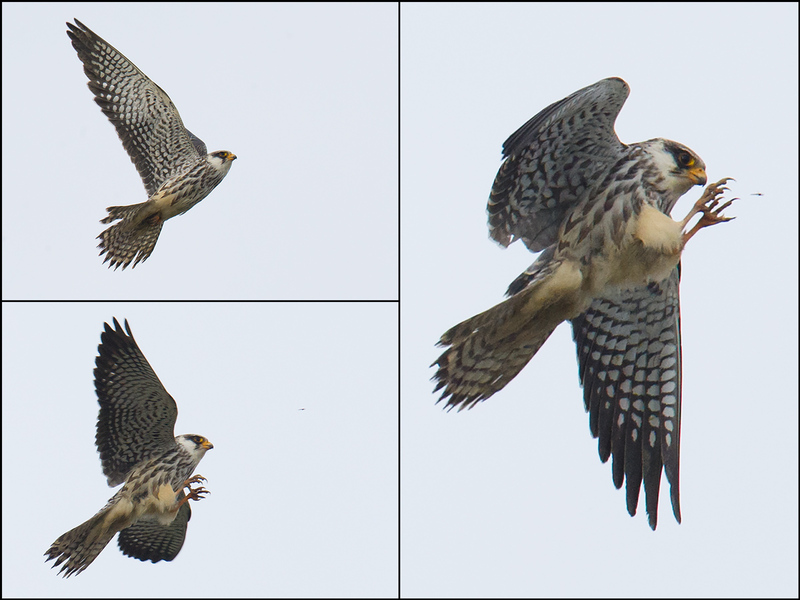 Jan-Erik and I got good sound recordings of the purported soror yesterday, and Charles Wu and I got some good shots, among them images of the outer tail feathers, which definitely had some white in them. CB: Right, Paul; thanks. The discussion yesterday was one of comparison and degree. How little must the white be in the tail, we were asking ourselves, for a Seicercus to “qualify” as Alström’s/Plain-tailed? Was the white in our photos a little or a lot? We ended up thinking a little, and that and the song we recorded led us to a determination of soror. I’ll post my photos and recordings as soon as I’m home. PH: Personally, Craig, I find it very difficult to judge the amount and distribution of white on the tails of these Seicercus in the field and think that a good photo with the tail splayed would really be necessary. Even then, the differences are small and subtle. Tricky group! Jonathan Martinez: Regarding the ID of these Seicercus, I have found that call is by far the easiest way to ID them. They all have a characteristic call. Some of them, like Alström’s or Bianchi’s, are usually quite vocal; others not as much. 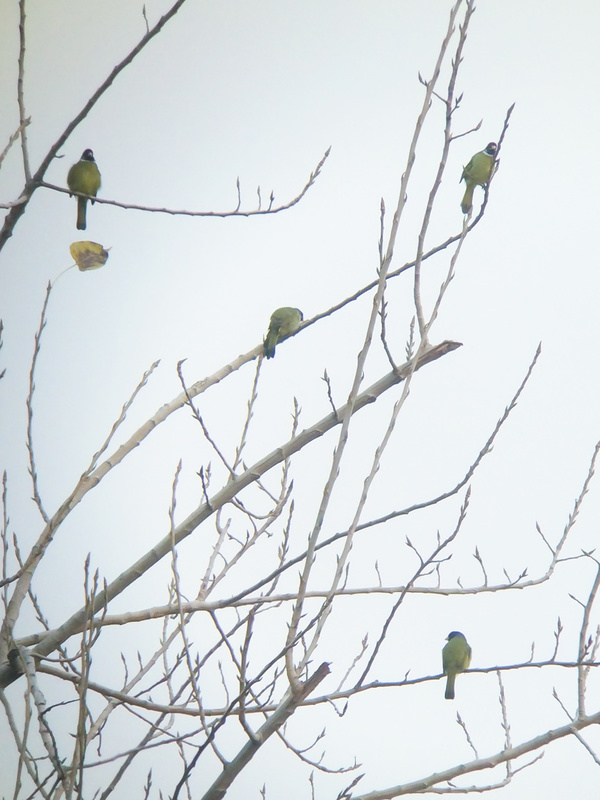 It requires much more experience or use of sonogram to ID them by song, but a few of them (Alström’s especially) include their call in their song, and some of them (Grey-crowned, Martens’s) include a trill in their song. Others do not (Alström, Bianchi’s). ID-ing them on plumage is, of course, a level up. 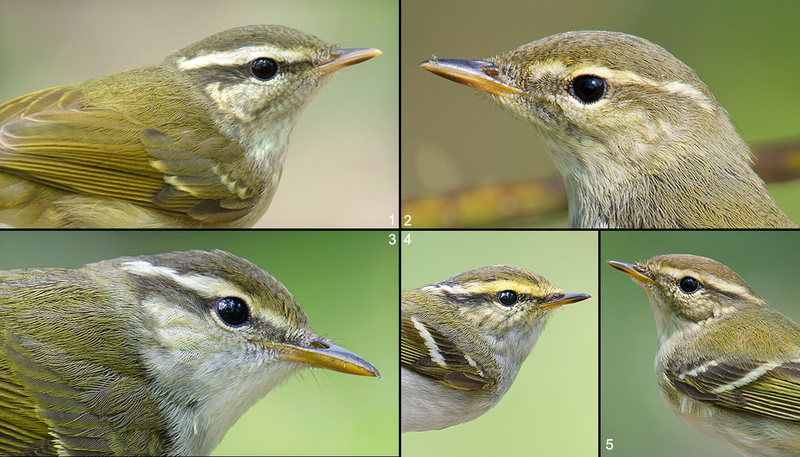 Elaine Du and I birded five of the eight days from Thurs. 24 Nov. through Thurs. 1 Dec. 2016. 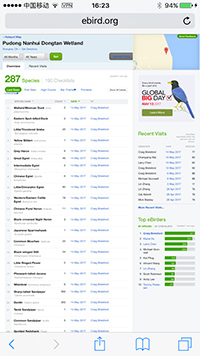 We noted 119 species. 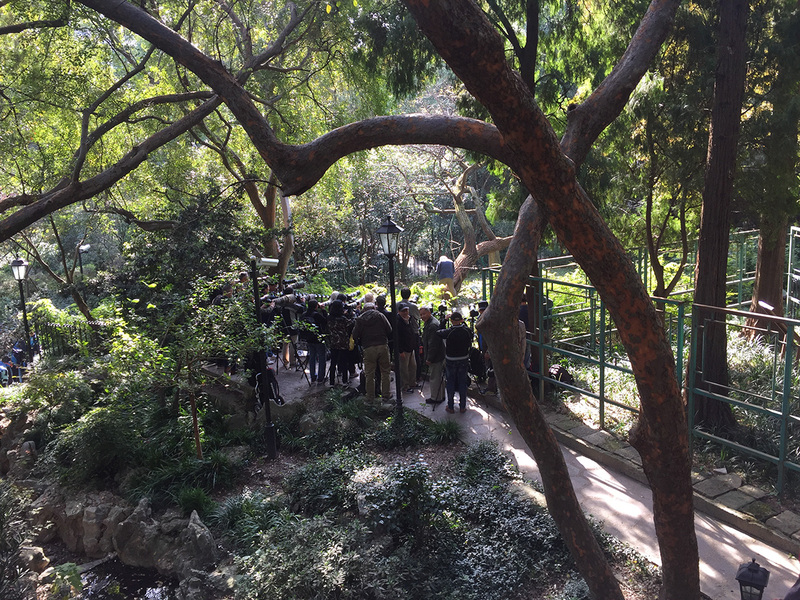 We did the Shanghai Grand Tour, covering Zhongshan Park, a small, inner-city park; Binjiang Forest Park and Binhai Forest Park, large, suburban parks; the coastal areas at Cape Nanhui; Hengsha Island; and Chongming Island. 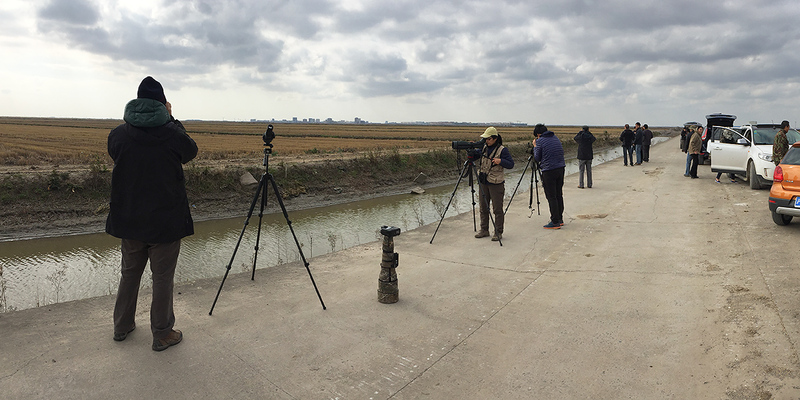 We birded one of the days with Shanghai-based British birder Michael Grunwell and two days with Phil Birch. We had 3 Siberian Crane and 8 Mandarin Duck on Hengsha, 98 Hooded Crane at their normal wintering spot on Chongming Island, 5 Baikal Teal and Japanese Grosbeak at Cape Nanhui, and 51 Swan Goose at Nanhui and on Chongming. 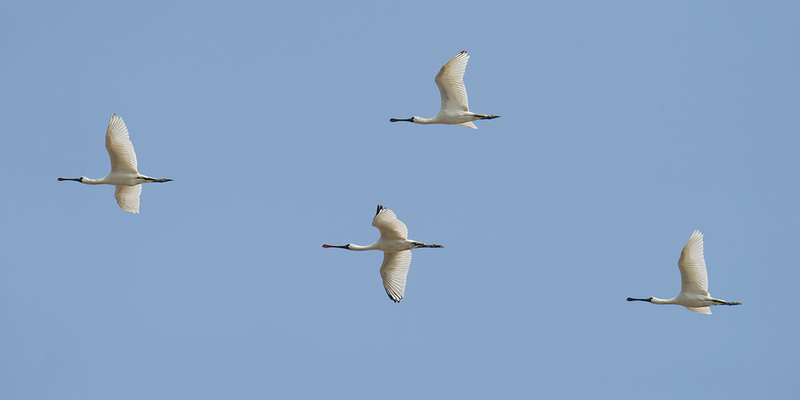 Black-faced Spoonbill were present in diminished numbers at Nanhui and on Hengsha. Nanhui gave us Common Shelduck, Greater Scaup, Black-necked Grebe at Dishui Lake, and Brown-cheeked Rail near Iron Track. Eurasian Curlew were foraging on mud near 3 Black-tailed Godwit and a single Bar-tailed Godwit. At a high-tide roost in the defunct nature reserve, a single late Red-necked Stint stood out among 600 Dunlin. 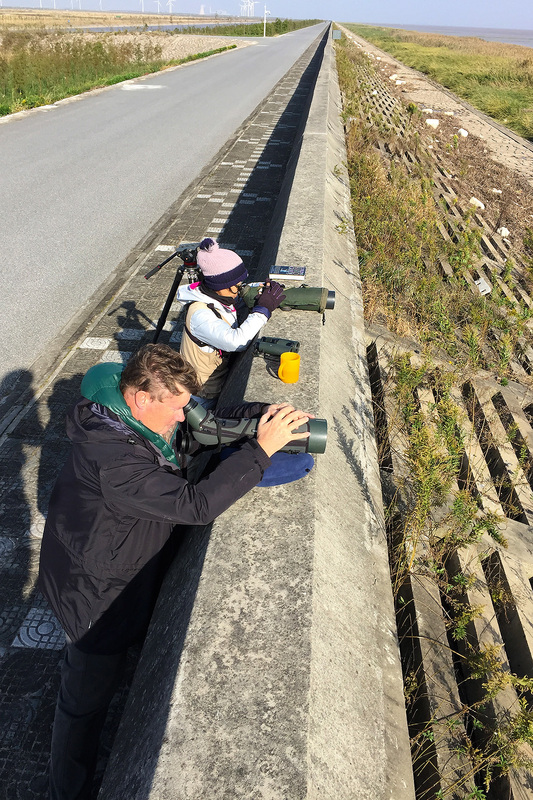 We found 2 Bluethroat at a new location north of the Dazhi River. 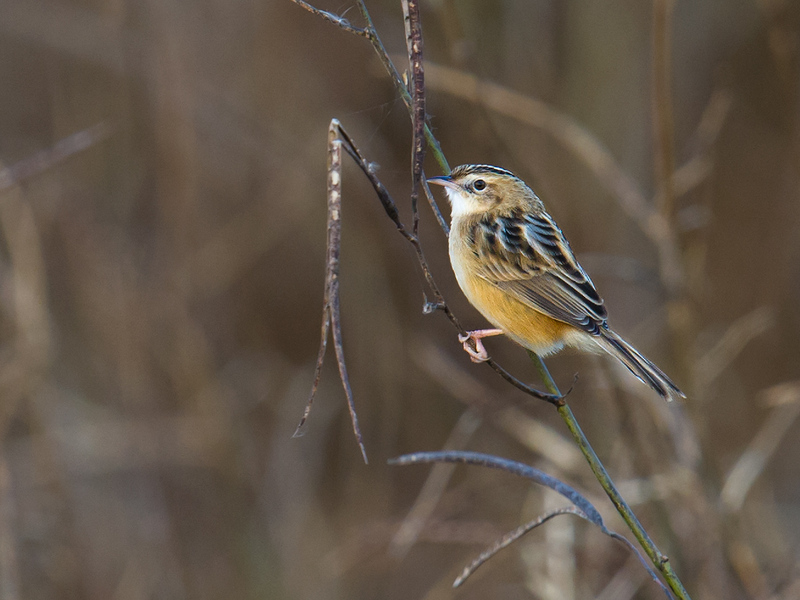 Reed Parrotbill maintained their regular presence around Iron Track, and we found 4 Rustic Bunting at Binhai Forest Park, 4 km inland from the coastal birding areas at Nanhui. Hensgha also gave us Common Merganser, late Intermediate Egret, 2 Hair-crested Drongo, and 1 of our 2 Chinese Grey Shrike (the other was at Nanhui). 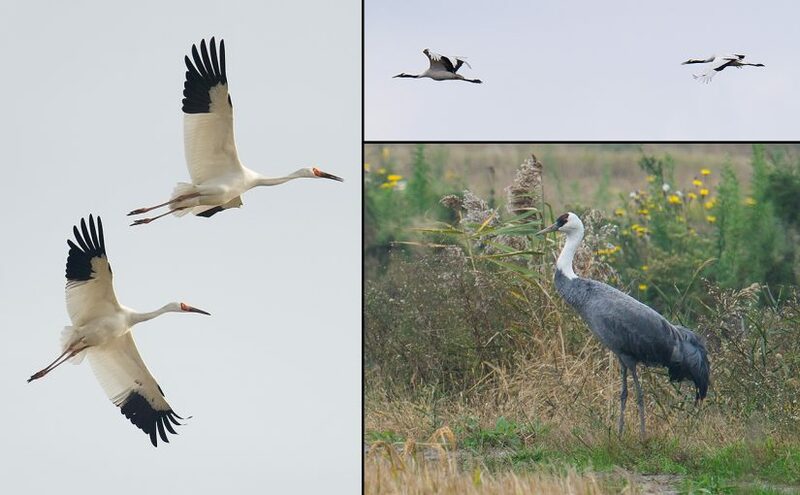 Chongming yielded 3 Common Crane with the Hooded Crane as well as Northern Lapwing, 3 juv. Rook, and 35 Lapland Longspur. Binjiang Forest Park added to our list Great Spotted Woodpecker, a species that in Shanghai’s parks is reliable only at Binjiang and Century Park. We had 3 Hawfinch, Collared Finchbill, and 3 Naumann’s Thrush. 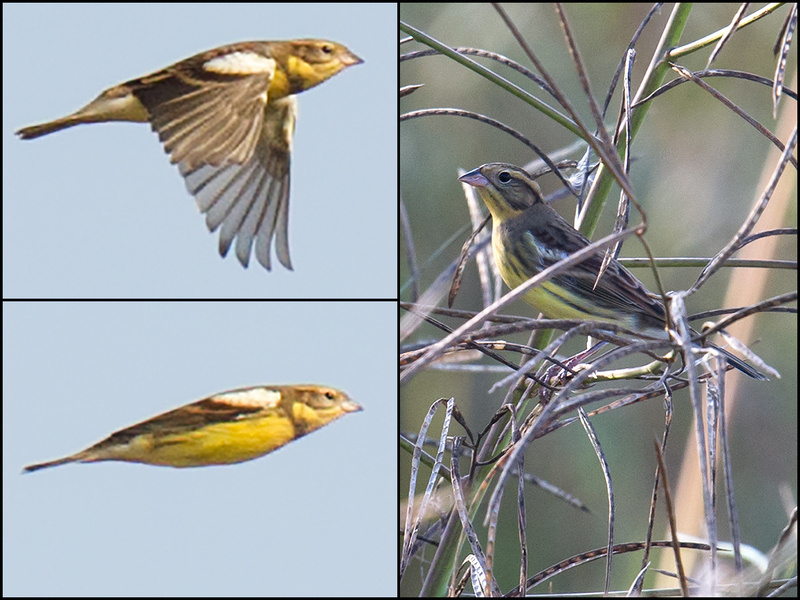 — In recent days at its special site (30.850707, 121.863662) north of Luchao, Yellow-breasted Bunting was not found on two occasions. We found it there six times throughout most of November. 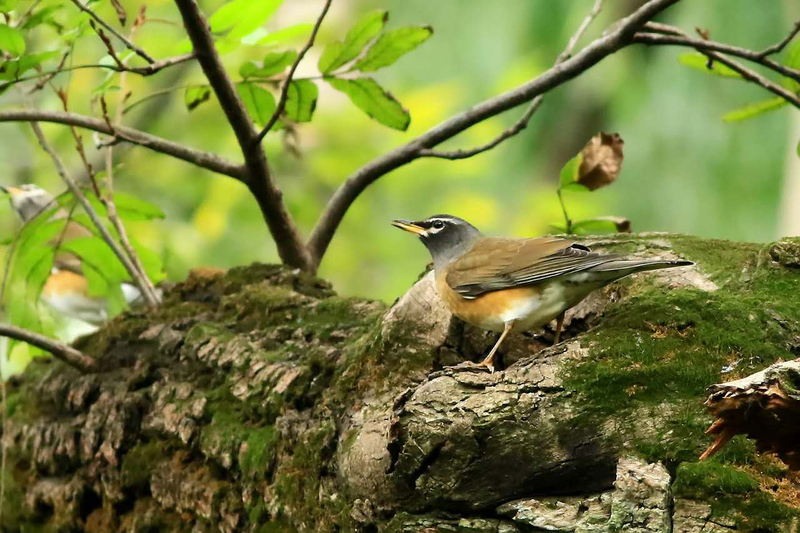 — Yellow-throated Bunting and most other woodland birds were absent from the Cape Nanhui microforests. The leaves of the locust trees in the microforests have fallen, the undergrowth has died off, and the woodsy feel has faded even at large Microforest 4 (30.953225, 121.959083). Eurasian Tree Sparrow have invaded some of the microforests. We found Pallas’s Reed Bunting in Microforest 4 but neither Red-flanked Bluetail nor White’s Thrush. 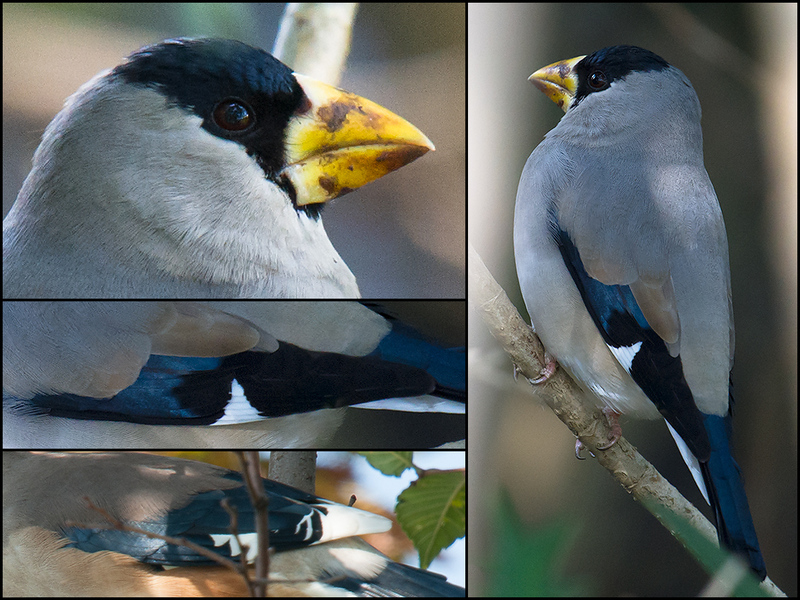 — Japanese Grosbeak found in Magic Parking Lot 28 Nov. provided my longest and best view ever of the species. 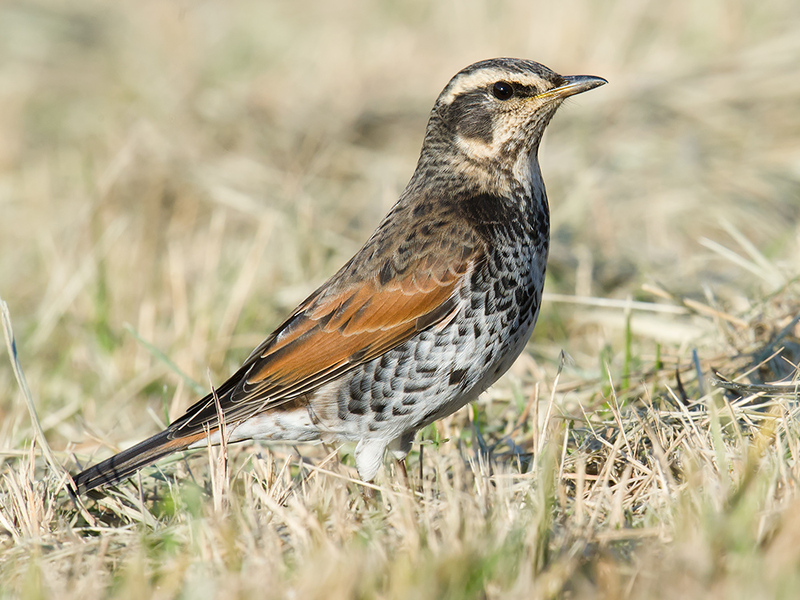 I appreciated its large size, like a thrush; I noted its half-hood and completely yellow bill; and I observed its single white spot on the primaries. On 24 Nov. 2016, I was standing beside Wāng Jìn Róng (汪进荣) when he got this shot of an adult-male Eyebrowed Thrush. The thrush was drinking from a cavity high in a tree at Zhongshan Park. 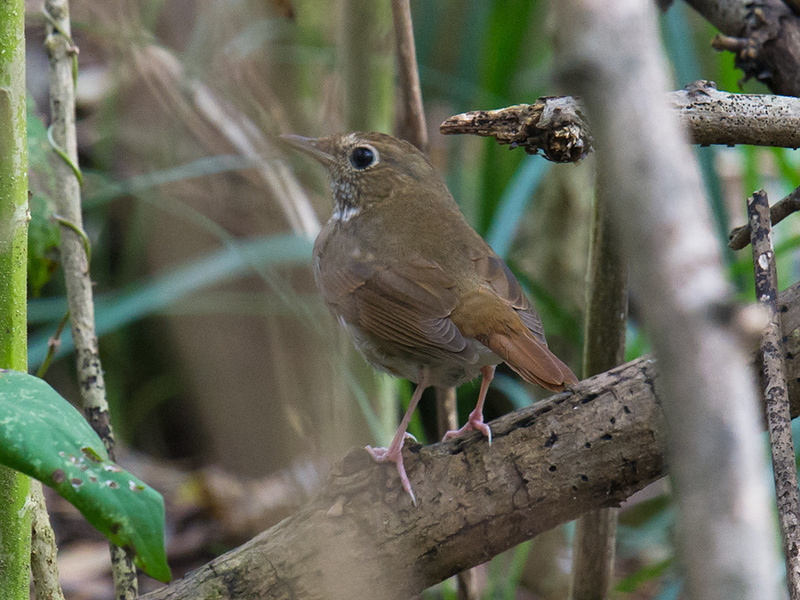 In recent days, seven species of thrush have been recorded around the Little Central Pond in the 102-year-old park. Editor’s note: This tranquil scene is from Iron Track (31.003613, 121.907883), home of Reed Parrotbill and dozens of other species, and part of the large reed beds on the Dazhi River at Cape Nanhui. 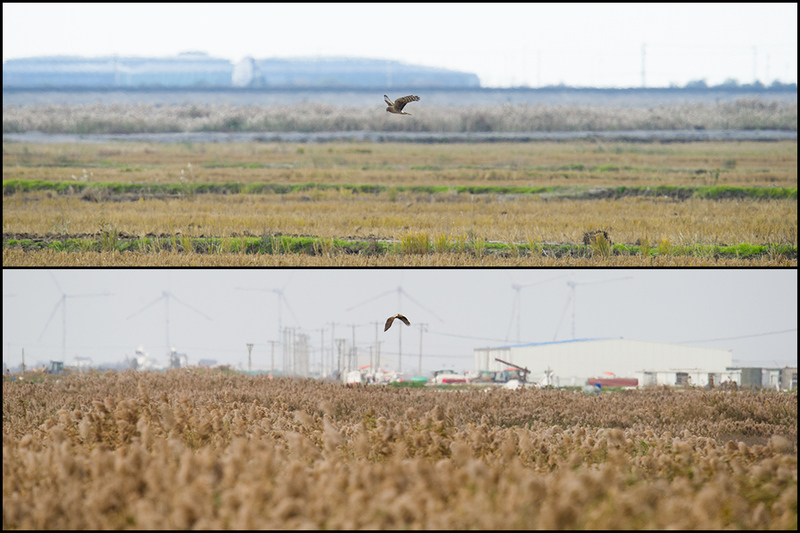 In the face of manic development, and in spite of being under no protection, Cape Nanhui conserves the best reed beds on the Shanghai Peninsula as well as mudflats critical to tens of thousands of migrating shorebirds. To save these treasures, Shanghai people must act now. Who will save Cape Nanhui? Not foreigners like me, but the people of Shanghai. 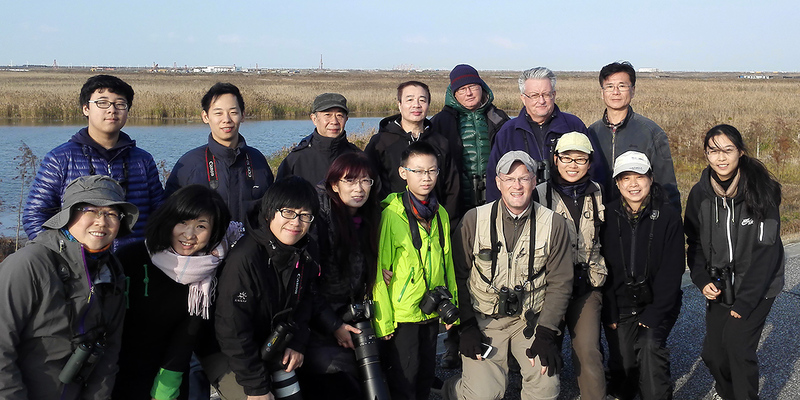 We foreigners are numerous in Shanghai and are disproportionately represented among the birders here. We can offer valuable perspectives. But if the people of Shanghai themselves do not wish to ensure a bright natural future for Cape Nanhui, then there is little that anyone can do. I think that the people of Shanghai are ready for real conservation on the Shanghai mainland. 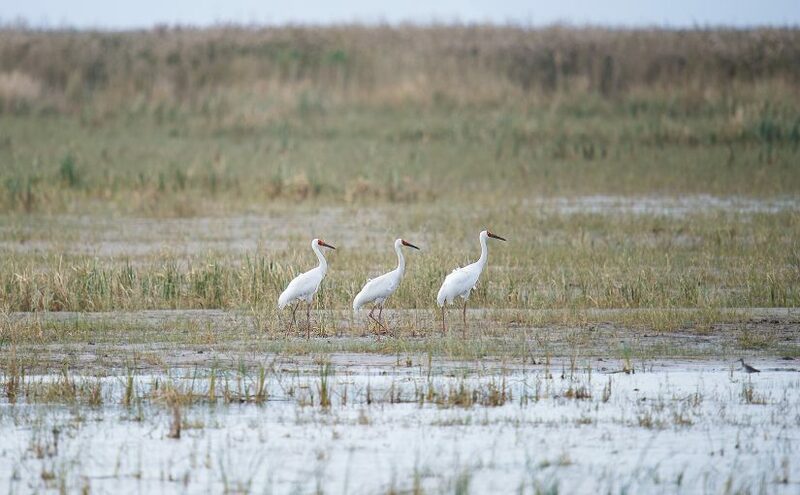 Basic conservationist ideas have broad appeal, and an easily accessible, world-class, “people’s wetland reserve” at Cape Nanhui is a basic conservationist idea. If I were Chinese and were arguing for a people’s wetland reserve for Cape Nanhui, then I would bring to light the following points. Shanghai “市” isn’t really a city or a “municipality,” as 市 is often translated. It is a city-province, accountable to no government but the national government. The city-province is vast, covering an area greater than the U.S. states of Delaware and Rhode Island. Shanghai is twice as big as Luxembourg, half as large as Northern Ireland, and a third the size of Wales. From a conservationist’s perspective, it is important to view Shanghai as a province and not a city, because cities are not usually thought of as being responsible for maintaining large nature reserves within their borders. Provinces, by contrast, are large enough to accommodate nature reserves. I propose that, where workable, we stop referring to Shanghai as a city or municipality and start applying to it the more accurate label of city-province. Any jurisdiction covering an area the size of a small country would be expected to conserve substantial amounts of its area. In the case of Shanghai, the call to conserve is even louder, because the area it occupies is unusually important for conservation. The Shanghai Peninsula is situated between the mouth of Asia’s greatest river and Hangzhou Bay. It is on the East Asian-Australasian Flyway and attracts tens of thousands of passage migrants representing a few hundred species. Cape Nanhui is the tip of the Shanghai Peninsula and attracts passage migrants and winter visitors such as the Endangered Black-faced Spoonbill. 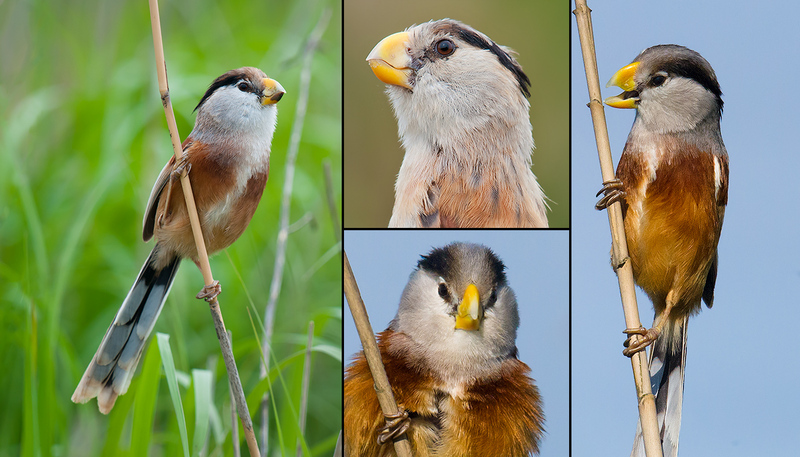 Its large reed beds are the final stronghold on the Shanghai Peninsula of Near Threatened Reed Parrotbill, a candidate for Shanghai Provincial Bird, as well as Near Threatened Marsh Grassbird. 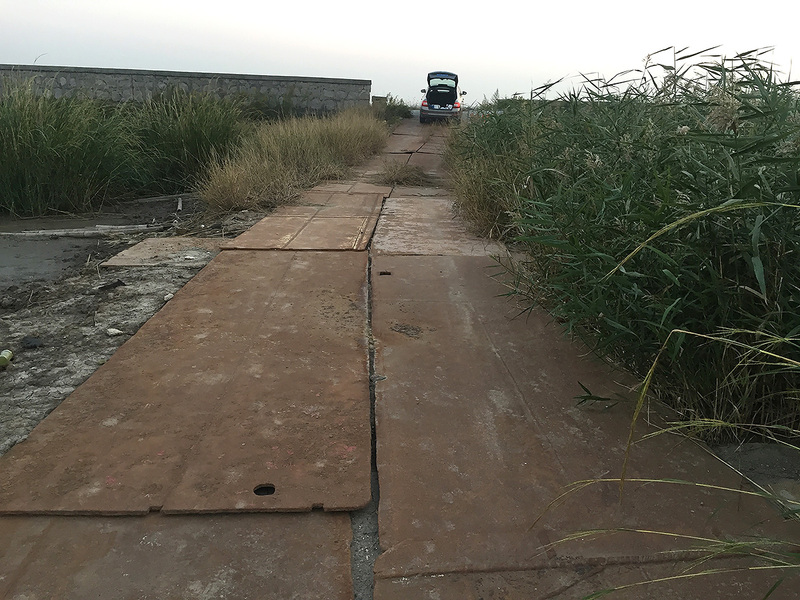 Cape Nanhui is completely unprotected; indeed, an attempt at a small wetland reserve has been shut down. The boardwalks and signs of the defunct reserve are crumbling, and the backhoes are standing by, waiting for the green light to smash what remains. No one is saying that Shanghai, a city-province of 26 million people, needs to create a Yellowstone. Any reasonable person understands the pressures the huge population of Shanghai puts on its natural resources. Also, it must be pointed out that in the far-flung areas of the city-province, Shanghai has made an attempt at conservation. 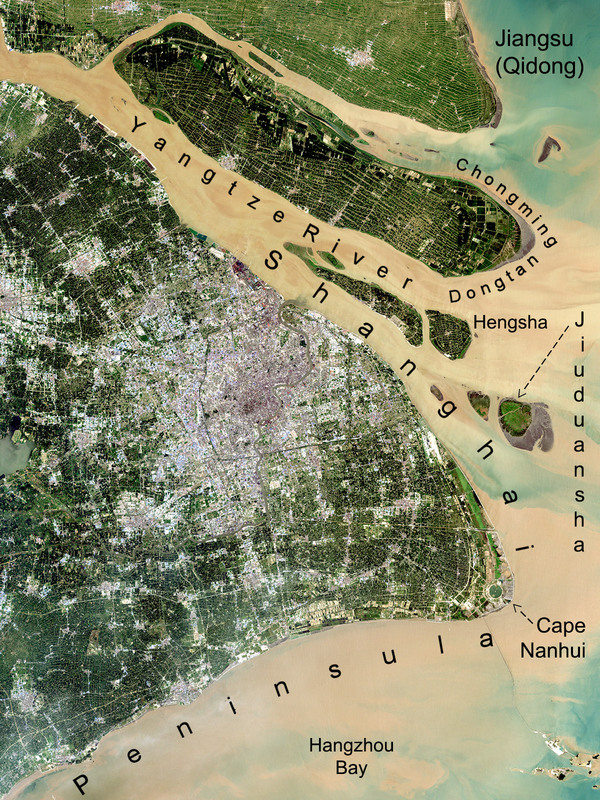 Chongming Dongtan preserves the eastern nub of Chongming Island, and Jiuduansha covers intertidal shoals near Pudong Airport. But Shanghai under-performs overall. Nowhere is the poor conservation performance more evident than in Pudong, the coastal city-within-a-city. Pudong is nearly double the size of Singapore and is half the size of Hong Kong. Yet the district contains zero wetland reserves on its mainland. Both Singapore and Hong Kong manage to hold in reserve significant portions of their territory. The southeastern tip of Pudong is Cape Nanhui, a place that despite being under no protection still brims with natural treasures. No place on the Shanghai Peninsula has as many reed beds. The projection of land attracts birds making the long journey across Hangzhou Bay and the wide mouth of the Yangtze. Moreover, Cape Nanhui is easily accessible to common people. It would be the perfect place for a world-class wetland reserve on the model of Sungei Buloh in Singapore and Yeyahu National Wetland Park in Beijing. We foreigners have had much to say about the future of Nanhui. I would like to hear more from Chinese. Is the case for a world-class wetland reserve at Nanhui convincing to you? If so, then what do you propose to do to bring it about? On Thurs. 3 Nov. 2016 Elaine Du and I found Spoon-billed Sandpiper at Cape Nanhui, the coastal birding site in Pudong. 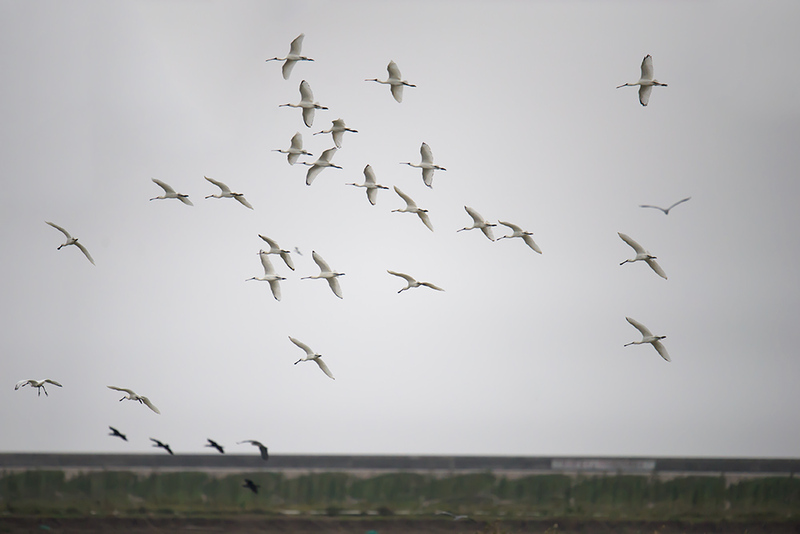 A single SBS was associating with a flock of 2600 waders in mud near the entrance to the defunct nature reserve. The SBS site is 4.3 km north of the Holiday Inn, and its coordinates are 30.921616, 121.969776. I have been viewing Spoon-billed Sandpiper a few times each year since 2011. Since 2013, Elaine has been with me. We know what to look for, and at this time of year when we see a large flock of small waders, the possibility of finding Spoon-billed Sandpiper is always on our mind. Seated, as is my wont, on the access road, my Swarovski ATX-95 spotting scope atop my tripod in front of me, I was scanning the flock of 2600 waders, looking for anomalies. The great majority (1920) of the birds were Dunlin, with Kentish Plover (620) the other major component. I saw a bird that was one of a kind. It was not associating with Kentish Plover or Dunlin. Unlike the plovers and Dunlin, which were resting and preening, the bird I was viewing was feeding. It was moving quickly and covering much ground. 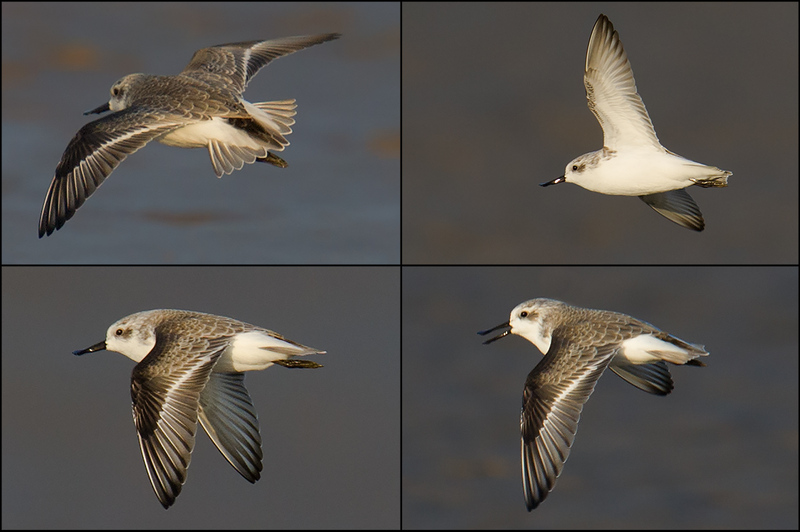 The constant movement, like a wind-up toy, reminded me of the Spoon-billed Sandpiper I have viewed at Yangkou and Dongtai. 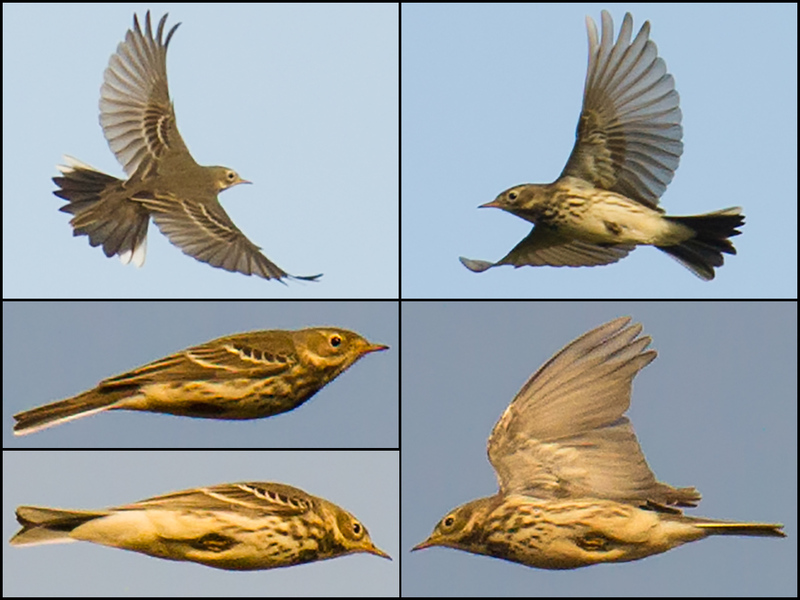 The speed at which the bird ran fit the pattern, as did the average length of sprint. The bird would occasionally take a short flight. 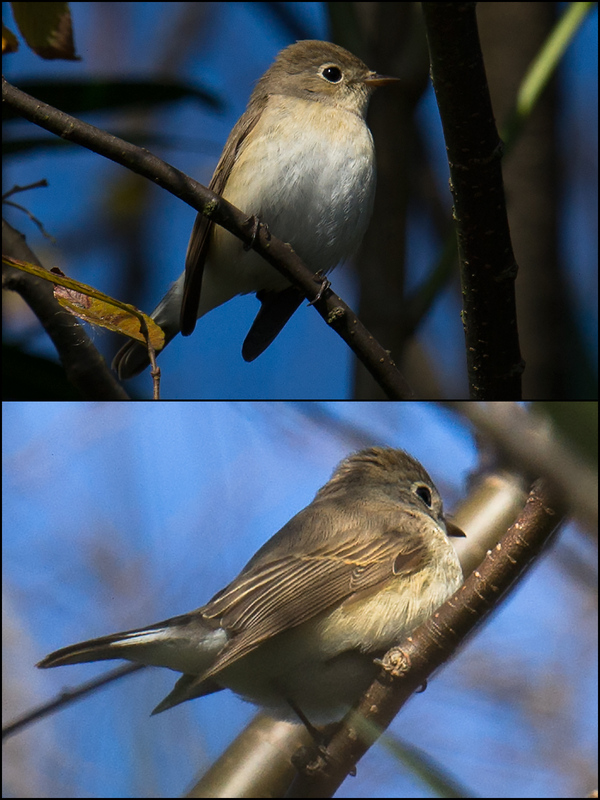 When it flew, the bird showed the white sides to its uppertail coverts. 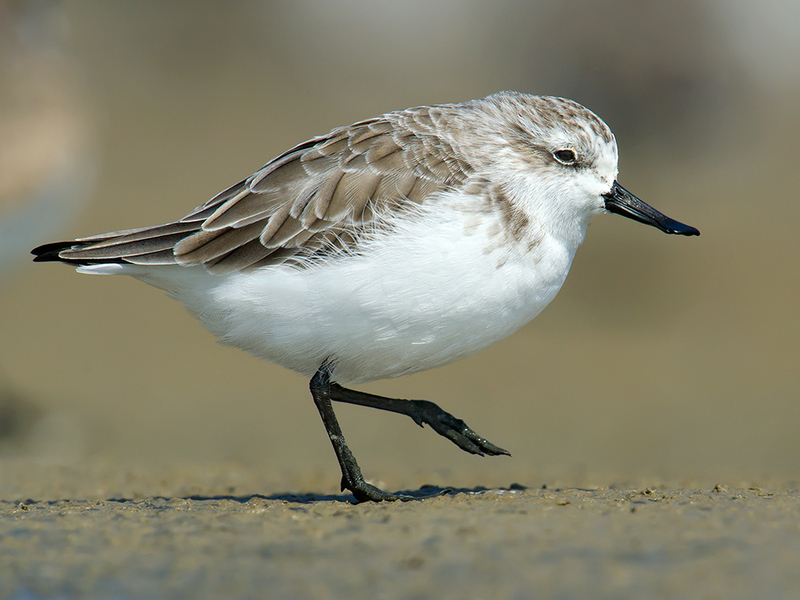 The foregoing did not prove Spoon-billed Sandpiper—other species such as Red-necked Stint share some of those characters. What I needed was a close view. Unfortunately, the galaxy of shorebirds was spread out between me and the Spoon-billed Sandpiper, and the SBS was obviously shying away. Finally the bird moved to within 150 meters of the road. Even through the heat haze, the scope brought home the trademark spatulate bill. 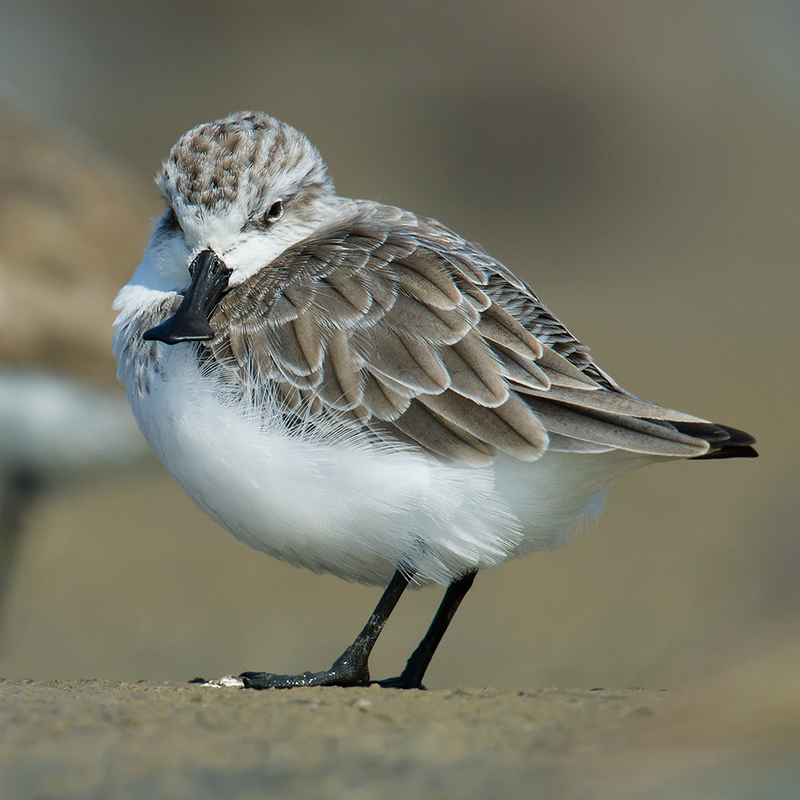 It is only somewhat surprising that Spoon-billed Sandpiper should be at Nanhui in early November. 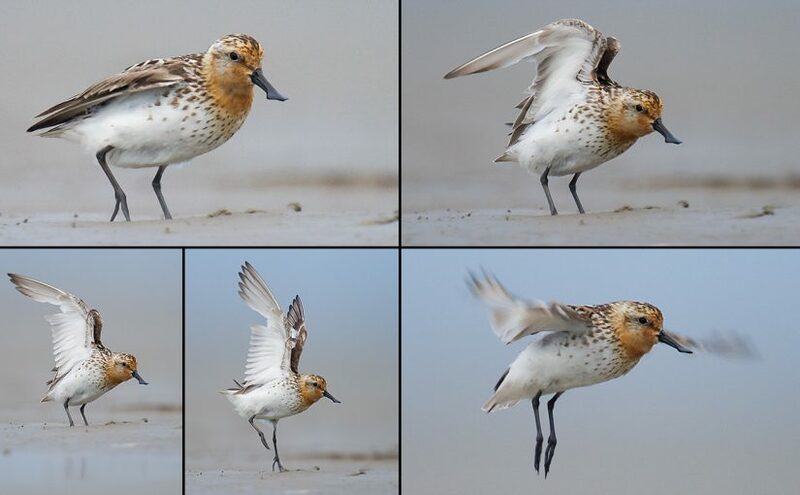 First, Spoon-billed Sandpiper quit the stopover sites in Jiangsu around the end of October and early November. 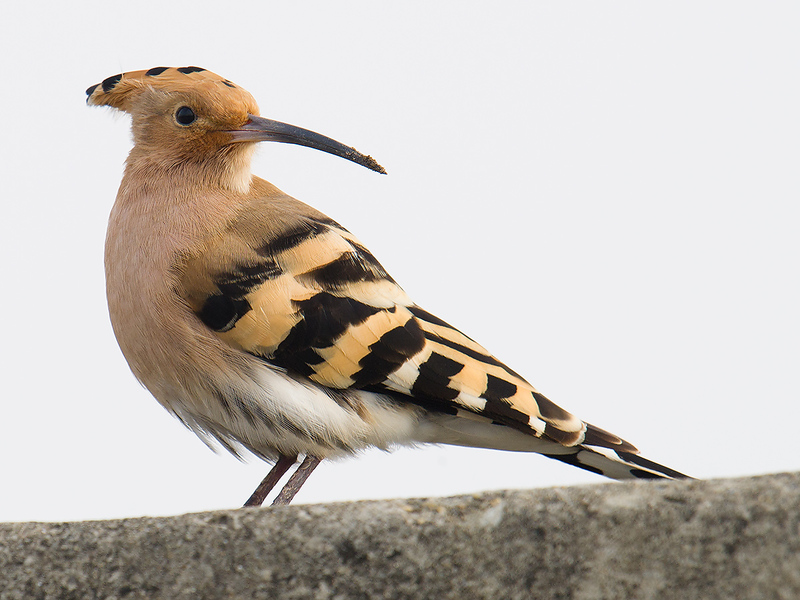 The Nanhui bird may have been one of them, and it may have stopped off in Shanghai for a quick refueling break as it heads south. 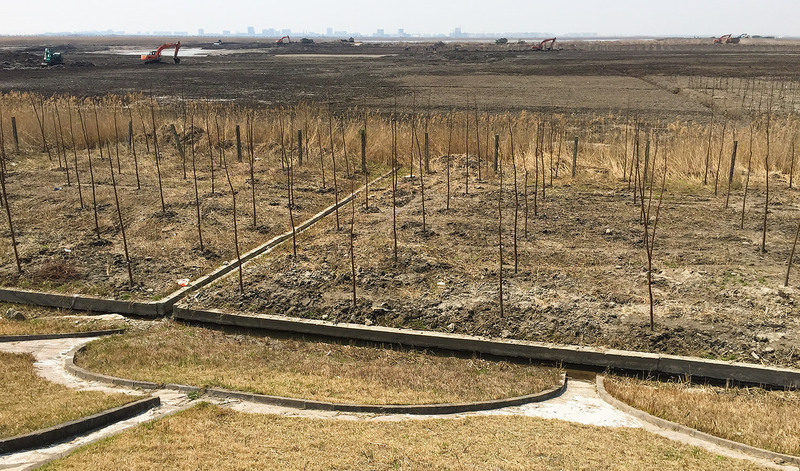 Second, as more and more of the Chinese coast is gobbled up by development, places such as the wetland at Nanhui, abandoned and gravely threatened as it is, take on greater and greater importance to migrating shorebirds. With so few places left for them, migrating waders pool in whatever hospitable area they can find. 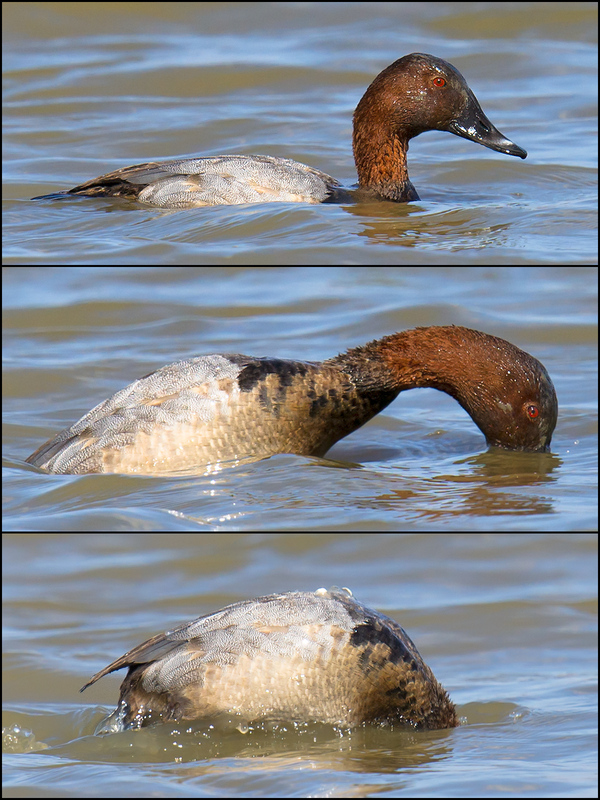 Small wonder, then, that in recent weeks the abandoned reserve has yielded Endangered Nordmann’s Greenshank and ultra-rarities such as Pomarine Jaeger and that the site is depended on by about 2 percent of the world’s Endangered Black-faced Spoonbill. 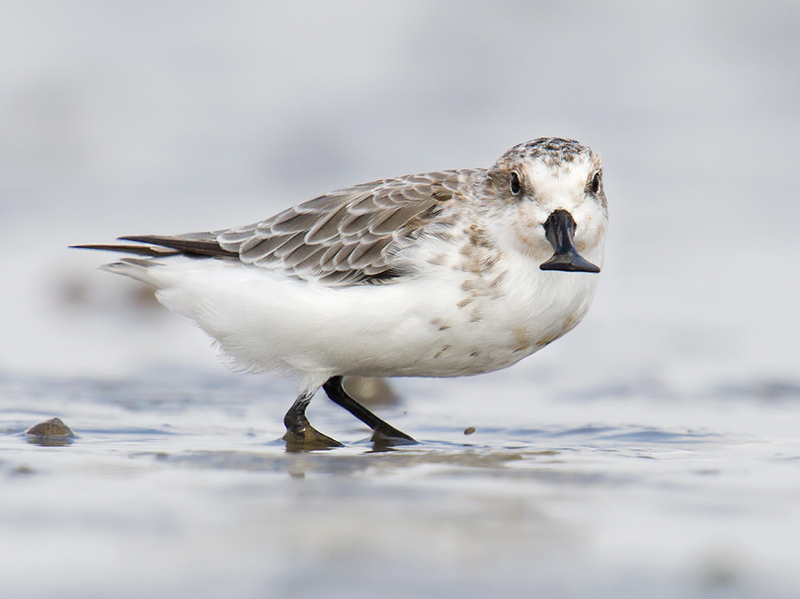 IUCN lists Spoon-billed Sandpiper as Critically Endangered. 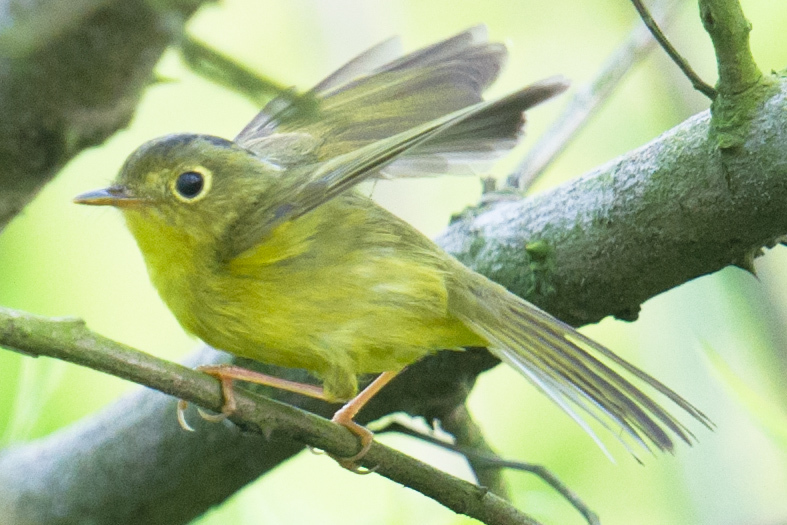 Only 500 to 800 of these birds are thought to exist. Excessive development along the Chinese coast is one of the main causes of its decline. 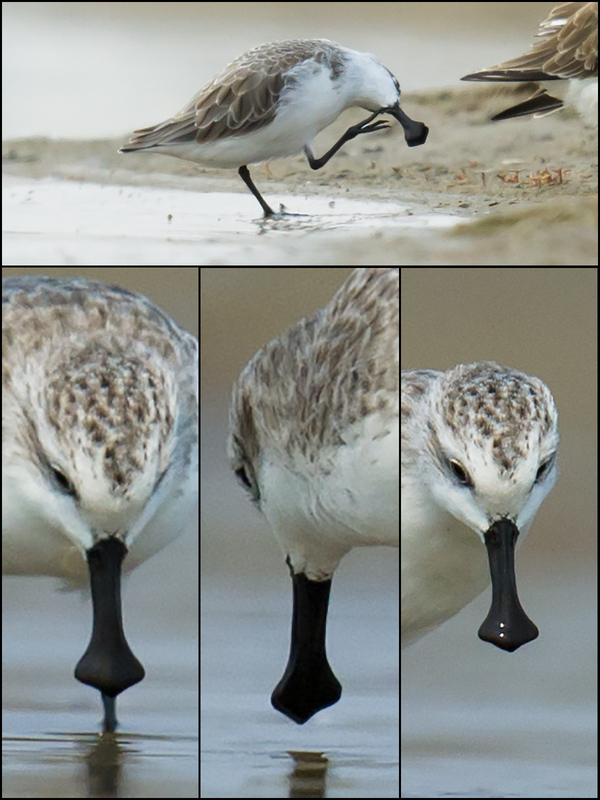 Last month, in Will the Spoon Survive?, I discussed coastal development and the future of Spoon-billed Sandpiper. 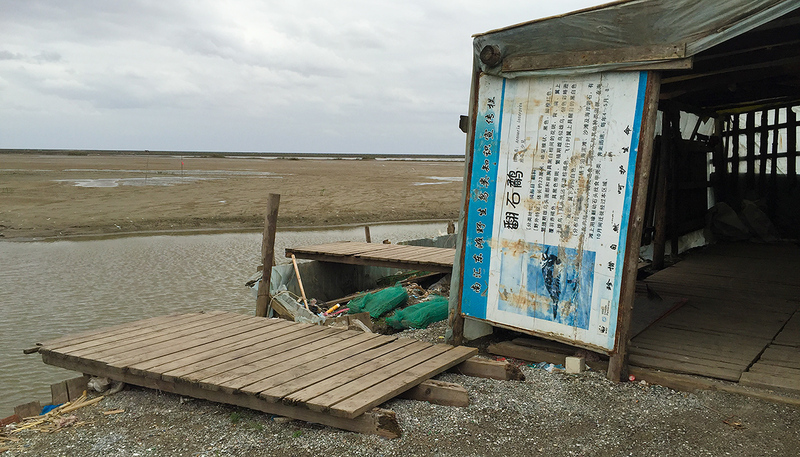 Earlier this week I published Save the Nanhui Wetland Reserve! 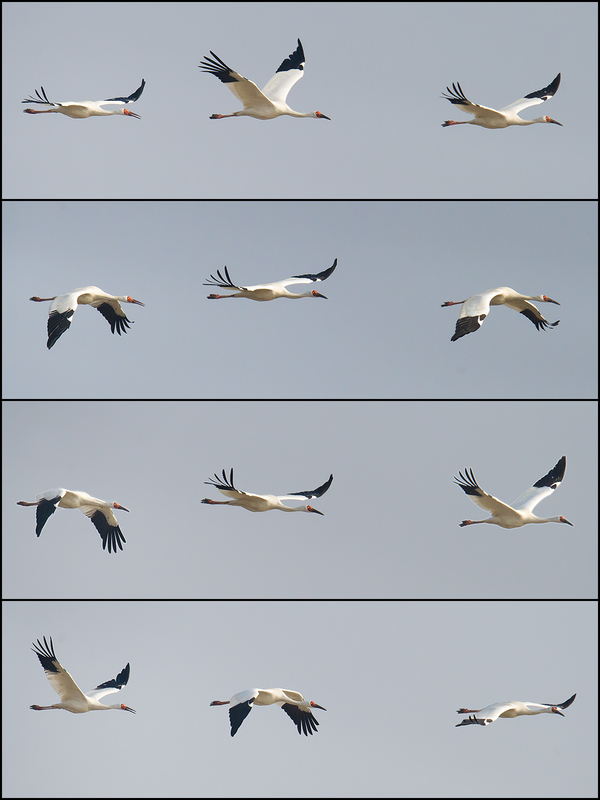 On Thursday at the defunct reserve, I saw yet again more than 50 Black-faced Spoonbill—by some measures, 2 percent of the world population of that endangered species. And I got to thinking again. The local people would forgo the cash that would have been generated by the development of the land. They would say, “We can’t develop every last square meter, after all.” They would cradle Black-faced Spoonbill to their bosom. At the site, further discoveries would be made. Nordmann’s Greenshank and Spoon-billed Sandpiper, two critically endangered species, also use the site. Great Knot, yet another endangered species, was there Thursday. Rarities like Pomarine Jaeger sometimes appear. Those species would find refuge in Earth’s largest city. They would have a permanent base in mainland Pudong. They would be the pride of Nanhui. The easily accessible site would become internationally known, like Mai Po in Hong Kong and Sungei Buloh in Singapore. Tourists would make trips to Shanghai—and on their visa application, under “purpose of visit,” write, “birdwatching.” Elementary schools would take field trips there. The kids would love it! The current reality is this. When I first started going to Nanhui back in 2008, Black-faced Spoonbill almost always were hundreds of meters away. They would occasionally appear in the canal at the base of the sea wall. If you so much as stopped your car, they would stop feeding. If you opened your door, they would fly a long way away. Now, in the defunct nature reserve, many of them are feeding right next to the access road. When you stop your car, they keep feeding. When you open your door, they fly 30 m back and start feeding again. 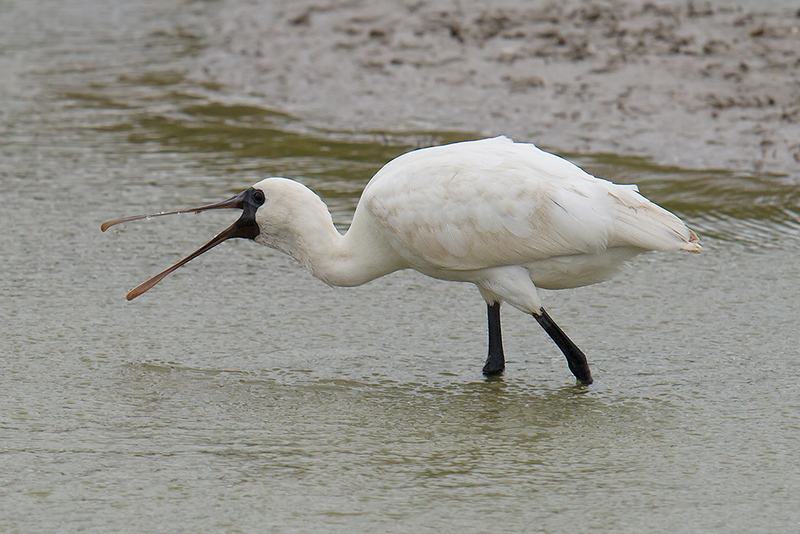 Have spoonbills lost their fear of man? Or, amid the shrinking of the local habitat, are they so desperate for a feed that they have lost their instinct to flee? Save the Nanhui Wetland Reserve! I like to extol the city in which I have spent the past nine years. 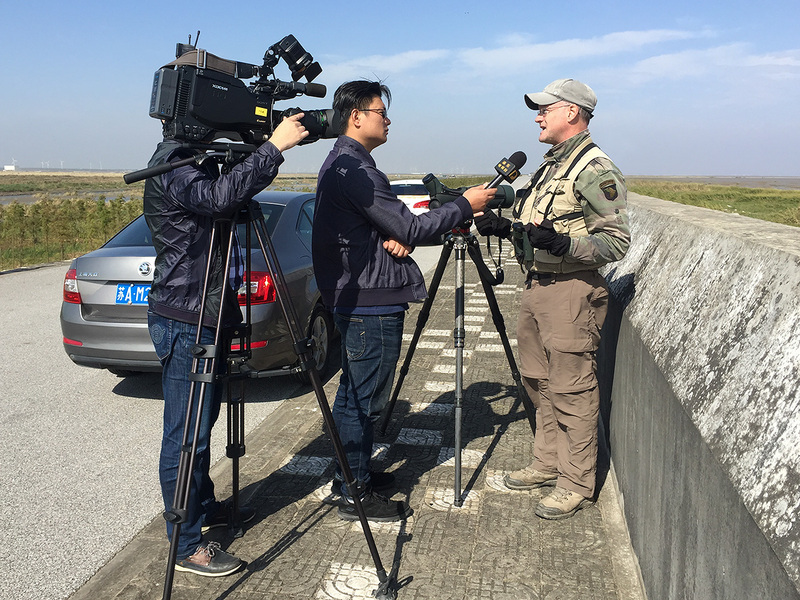 I like to tell people about the green side of Shanghai, the city at the mouth of Asia’s greatest river and on Earth’s greatest migratory flyway. How exciting it is to bird in Earth’s largest city. I see in Shanghai an opportunity to show the rest of China how to cherish its natural heritage. The people of Shanghai can teach China and the world to view nature as an asset. 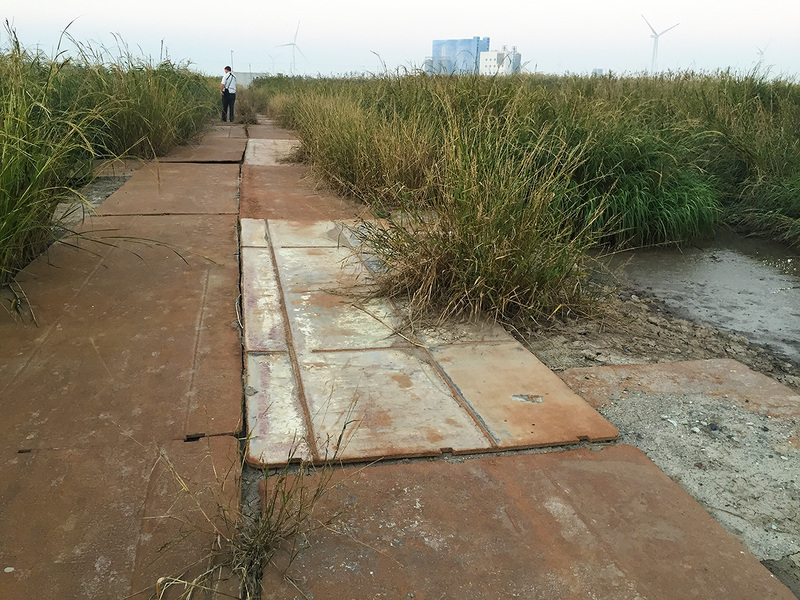 They can do this by creating an easily accessible wetland reserve at Nanhui. Shanghai already is an environmental leader, in a way. My wife Elaine Du and I have toured the 330 km (205 mi.) stretch of coast from Nanhui to Yancheng in Jiangsu. Remaining mudflats and wetlands are very few–and some of the best are not those found in the less-populated areas but those found in the megalopolis of Shanghai. Eastern Chongming Island enjoys considerable protection, and there is Jiuduansha (31.166667, 121.925000), intertidal wetland shoals in the sea near Pudong Airport. Birds of the defunct wetland reserve at Nanhui, 29 Oct. 2016. Panel 1: Nordmann’s Greenshank Tringa guttifer. 2: Black-faced Spoonbill Platalea minor. 3a-3d: Saunders’s Gull Chroicocephalus saundersi. 4: Ruff Calidris pugnax. Photos in panels 1, 3d, and 4 by Elaine Du. Others by Craig Brelsford. The problem with Jiuduansha especially and to a lesser extent Chongming Dongtan is that they are not easily accessible. The next step for Shanghai is a nature reserve easily accessed by the people, along the lines of the Mai Po Marshes in Hong Kong and Sungei Buloh in Singapore. It is amazing to me that such a reserve was not in the master plans for Pudong when the New Area was conceived. Pudong is big–it covers 1210 sq. km (467 sq. mi. ), nearly twice the size of Singapore. Within this New Area you have the world-class urban architecture and business districts around Lujiazui, you now have world-class family entertainment at the Shanghai Disney Resort–and you have world-class wildlife, the natural inheritance of the city, waiting on the coast, ready to be preserved, experienced, and loved. There is moreover the example of other Asian megacities such as the aforementioned two that found room for wildlife–and that wear their urban reserves as a badge of civic pride. Mai Po and Sungei Buloh are easily reachable by bus. In Shanghai, the Metro already reaches Lingang New City, and a cheap, fast taxi ride gets you from Dishui Lake Station to Nanhui’s abandoned wetland reserve 8 km away (at 30.920507, 121.973159). 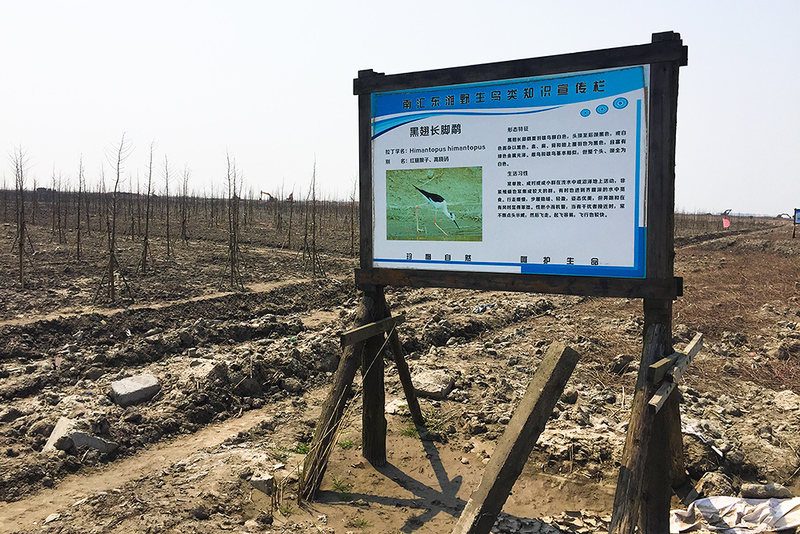 The infrastructure for an accessible “people’s nature reserve” is in place, and the birds are there at Nanhui, crying out for real, lasting protection. Sungei Buloh is a particularly good example for Pudong, as Sungei Buloh is about the same size (1.3 sq. km) as the defunct nature reserve at Nanhui (1.2 sq. km). Like Nanhui’s defunct reserve, Sungei Buloh was not originally considered a likely place for a nature reserve. Sungei Buloh was willed into being by the actions of local nature lovers who understood the value of the site. Likewise, a change of heart and an act of will can bring the abandoned reserve at Nanhui back from the brink. The sight of Nanhui’s defunct reserve, which apparently just missed being dredged and drained this year, and which could well be torn up next year, saddens me–not just because of the endangered Black-faced Spoonbill that so obviously rely on the place, and not only for the endangered Nordmann’s Greenshank that has been living there–but also for the grandchildren of the people currently making the decisions, who may have these treasures denied them, and who may fail to appreciate the natural heritage of this great city. The development plans for Pudong in general and Nanhui and Lingang New City in particular need to have a major component dedicated to conservation. Jiuduansha is simply not enough for Pudong. 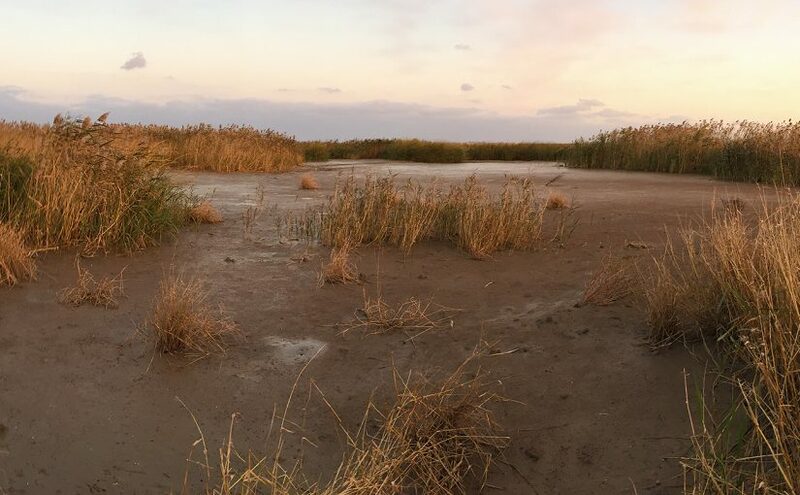 Those mud banks, barely above sea level, are a place for researchers, not the public. To meet the standard set by other coastal megacities, Pudong needs an easily accessible nature reserve on its mainland. That defunct nature reserve is just the place. 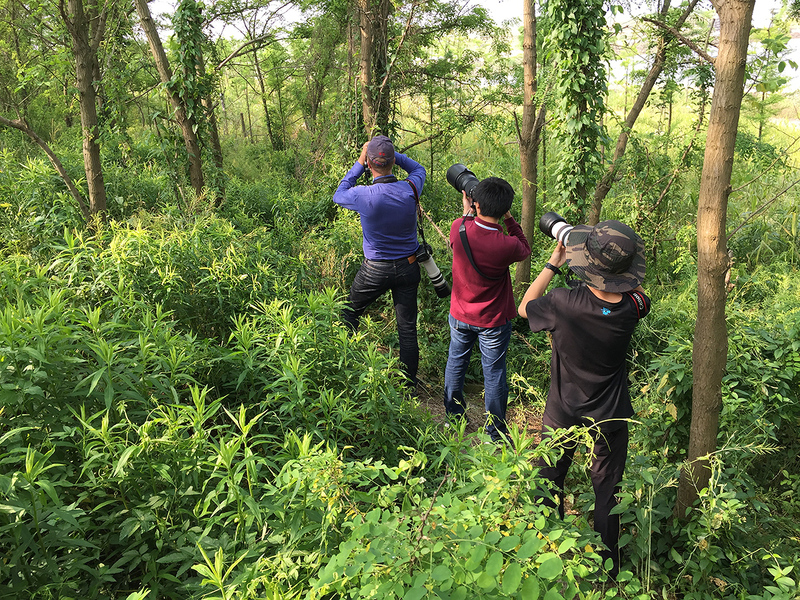 I think some local people realize the dire situation at Nanhui, and I understand that local birders had much to do with the one-year stay of execution granted the abandoned nature reserve. 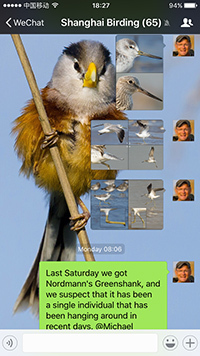 Those birders deserve everyone’s thanks. I think I speak for many foreigners when I say to my Shanghai conservationist friends: If you need our support, then we will give it to you. Ideas, a pat on the back, anything–we’re here. 加油! 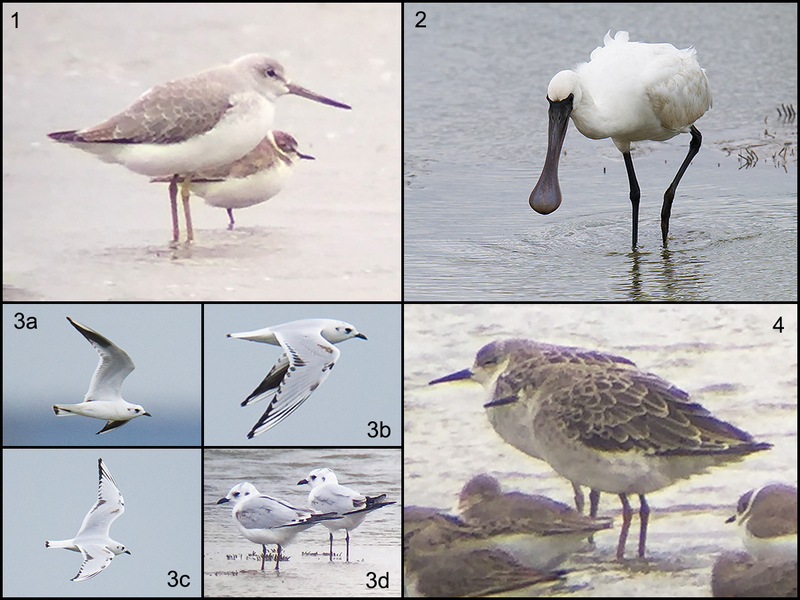 Posted on November 2, 2016 April 13, 2019 Author Craig BrelsfordTags Asian birds, bird conservation, birding in China, Black-faced Spoonbill, Nordmann's Greenshank, Shanghai birding3 Comments on Save the Nanhui Wetland Reserve!